Just when the Victoria market was starting to show some signs of life after four years of decline, the noose is tightened a bit more. First off, the BC Financial Institutions Commission (FICOM) is proposing a set of Residential Mortgage Underwriting Guidelines to bring BC credit unions (who are not covered under the federal Office of the Superintendent of Financial Institutions, or OSFI) in line with federal regulations restricting HELOCs to a max of 65% of the value of the mortgage, amongst other restrictions. In an interview with CMT, Doug McLean, the Deputy Superintendent of FICOM claims that the new BC guidelines have nothing to do with the feds, but they were certainly inspired by them given the similarities. Perhaps Doug also got a little antsy from the likes of Vancity offering a little too much lending "innovation" by letting people borrow half their minimum down payments. The new guidelines are out for feedback, but if I know government agencies, that's hardly more than a formality and they will likely be adopted almost as is. How many people will be affected? Impossible to say, but what's certain is this will prevent some people from extracting equity from their homes, and prevent others from qualifying to buy, thus taking some demand out of the market. At the same time, CMHC is getting nervous again and is tightening the screws on borrowers. CMHC has announced that they will stop insuring second homes (Finally! Which industry shill on their board thought that was ever reasonable??) and stop accepting "non-traditional" (aka fake) proof of income for self-employed borrowers. Again, the impact isn't huge, with those programs making up only 3% of CMHC business, but the little adjustments add up (more info on the changes here). And CMHC isn't done yet, even announcing that more changes are coming. Funny how things change when you throw out the industry insiders and bring in people that actually know how to regulate financial institutions. All this comes with the chance it might destabilize our apparently stabilizing market. 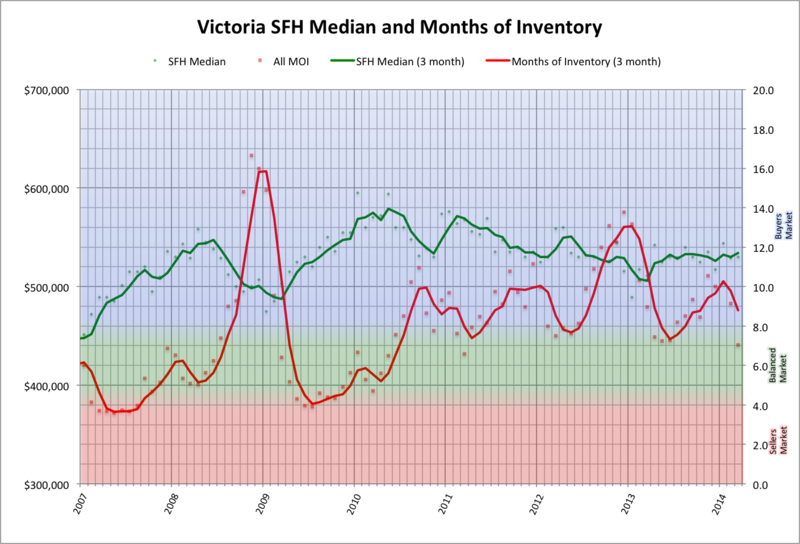 After 4 years of decline and 6 years of flat prices in Victoria, it seems our market has shed some risk while the rest of the country continued to go bananas (1.3 months of inventory in Calgary right now!). However the government remains the wildcard in this game, and they are not concerned with little Victoria. In order to slow the nation, Victoria might get sideswiped. Just about done with April, and it's slowed down a bit from the pace we saw at the beginning of the month. In fact, it looks like for the first time in almost a year the sales/list ratio will be lower than last year. Sales will be higher, but if this is the start of a shift the months of YoY improvements might be over. Same pace continues, sales ahead of last year. This month might even be ok compared to more than just last year, but I don't think it'll be anything to write home about. Teranet for March is out, flat year over year. The beginning of the month predictor said to expect 705 sales, which should be pretty accurate given that sales are still accelerating through April. What happened to the old spinmeisters at the VREB? Gone are the days when we needed this blog to de-spin the VREB press release and no matter the market it was a good time to buy. Ever since Tim took over, the press releases have been getting progressively more restrained and, dare I say it, balanced? 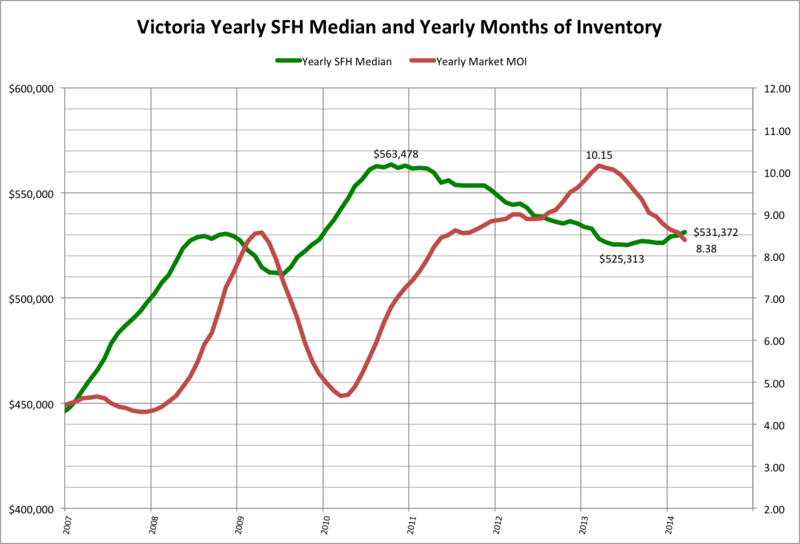 It starts with the title, "March 2014 Real Estate Activity in Victoria". That's so boring I could have written it. 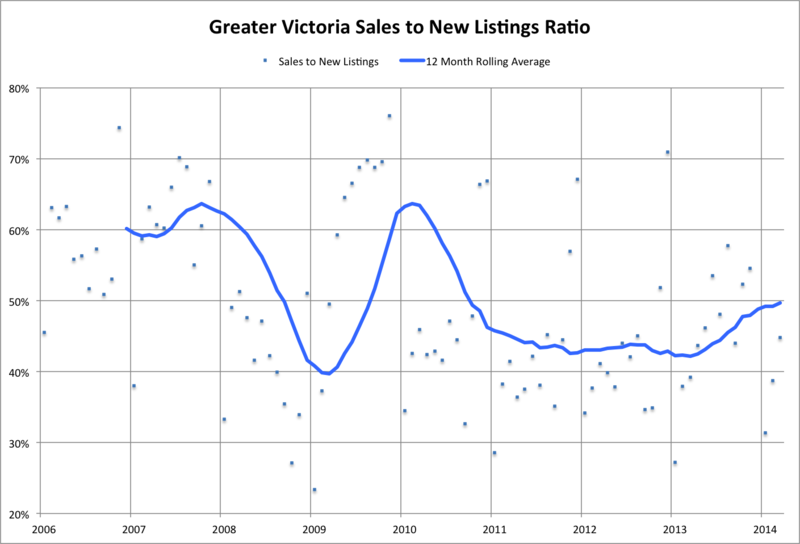 What happened to "Spring Market Rebounds in Victoria?" or "Buyers Frothing at the Mouth for Your Home"? After all, sales are up almost 20% from last year. It's here I would point out the problem with that comparison, but Tim has thought ahead; so I'm reduced to a lame "what he said". Prices are flat according to the MLS HPI, and the market according to Tim is balanced. "There is no extreme upward or downward pressure on housing prices right now". Sure enough, the data agrees. MOI of 7 is a bit less than the March of the last 3 years, but still on the high side of a balanced market. Sales to list is again stronger than the last years, but not strong. I like the yearly data because it flattens out all the seasonality and minor price movements. And something unusual is happening. Whether due to sales mix changes or actual price increases, the yearly median price has gone up for a few months now. That hasn't happened since the last peak in 2010. $5000 isn't much, but it's a break from the multi-year trend we've seen. However, as Just Jack says, if you really want to know what's going on, you have to look at the segment of the market you're interested in.